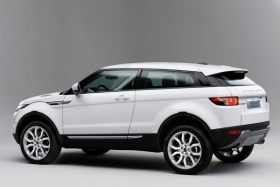 The Evoque is 17 inches shorter than the Range Rover Sport and uses a modified version of the Land Rover LR2 platform. As the Paris auto show approaches next week, Land Rover is revealing a little more information about its Evoque, the smallest and lightest SUV the automaker will offer. The compact Evoque will debut at the show Sept. 30. U.S. sales begin in fall 2011. The vehicle was unveiled in July, but Land Rover provided little information at that time. The two-door Evoque maintains much of the styling from the LRX concept that it unveiled two years ago. The SUV is targeting a new group of buyers with what is expected to be the company's lowest-priced vehicle. “The Range Rover Evoque helps to define a new segment for premium compact SUVs which are more sporting and stylish. It makes a strong statement about the future direction of the Range Rover brand,” Ralf Speth, Jaguar Land Rover CEO, said in a statement Wednesday. Under the hood is a turbocharged, 2.0-liter, four-cylinder engine with direct injection and variable valve timing, rated at 240 hp. It is mated to a six-speed automatic transmission. The Evoque is fitted with an electric power-steering system to boost fuel economy. A MagneRide damping system is optional. The shocks are filled with fluid that contains magnetic particles that are activated by an electric current. The amount of current sent through the liquid softens or stiffens the dampening effect.